As we inch ever closer to Rift’s 3.4 update, Trion Worlds has decided to start the free to play MMORPG’s PR train with a zone breakdown. As we wait for all of the nitty gritty details on the new Primalist calling, today we get to take a peek at the lands the Primalists view as their own. Patch 3.4’s Planetouched Wilds includes 5 named areas and a smattering of smaller, off the beaten path locations. 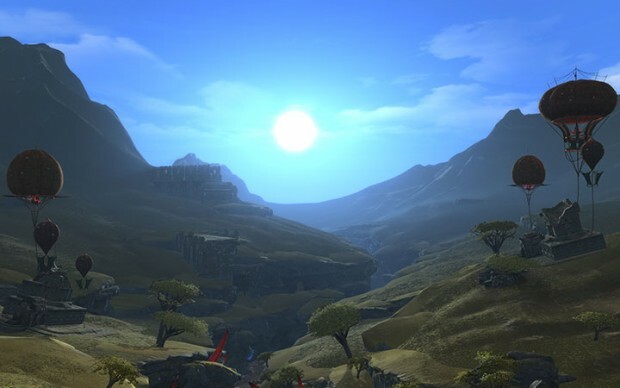 The Cosmic Steppes, Ovog Shrine, Rhaza’de Canyons, Shal Korva, and Sky Fishery locations all play host to new wildlife that will presumably be slaughtered by the game’s players. These locations also tie directly into how the Primalists view the world and how their culture was raised. If you’re a bit of a lore/immersion junkie, check out the full post for more details. Game has “PREMIUM” classes… enough said to warranty how the game has become…. They aren’t OP, they’re basically like cosmetic playstyles. its a boring 5 dead colored buged wow clone uncreative.. a trion pice of sh…t! It’s a WoW Clone, but a mediocre one. Not everyone can afford WoW douchebag.